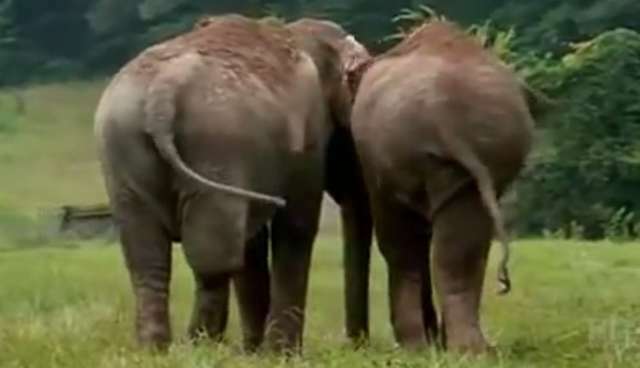 Back in 2000, PBS aired the remarkable story of Shirley and Jenny, former circus elephants reunited at the Elephant Sanctuary in Tennessee after spending 22 years apart. Since then, the documentary has garnered many more million views online, offering a poignant reminder of these animal's capacity to feel happiness in a way that's so easily palpable. The elephants' keepers say that long after the cameras stopped rolling in the clip above, Shirley and Jenny continued to live in bliss, reforging that close-knit bond which had been cut short when the two animals were separated more than two decades earlier. Sadly, the sanctuary reported that Jenny passed away in 2006 after battling a long illness, surrounded by Shirley and her caregivers. "It was very hard and especially hard on Shirley," says sanctuary director, Carol Buckley, adding that she refused food for two days afterwards. But just the joy seen in Shirley and Jenny's reunion suggests an emotional sense not unlike our own, so too does the similarity in which we grieve. Elephants are among the only non-human animals to have a recognizable ritual following a death -- often involving fasting or holding vigil by their fallen friend's side. Although memories of her beloved friend no doubt remain, today Shirley appears to be living happily on the grounds of the sprawling sanctuary among the dozen other rescued elephants that make up her adopted herd.